Float in the salty waters of the Cejar Lagoon in the heart of Chile’s Atacama Desert. Traverse the desert by car to reach the huge lake that abounds with enormous salt deposits underneath its surface. 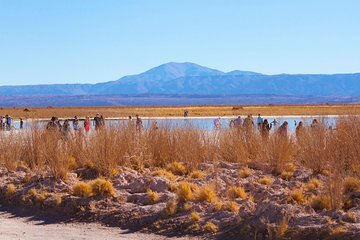 After a salty dip, head to the Salt Flat Eyes to swim in the freshwater pools of Atacama and end the tour with a sunset aperitif while admiring the dry, Andean landscapes.